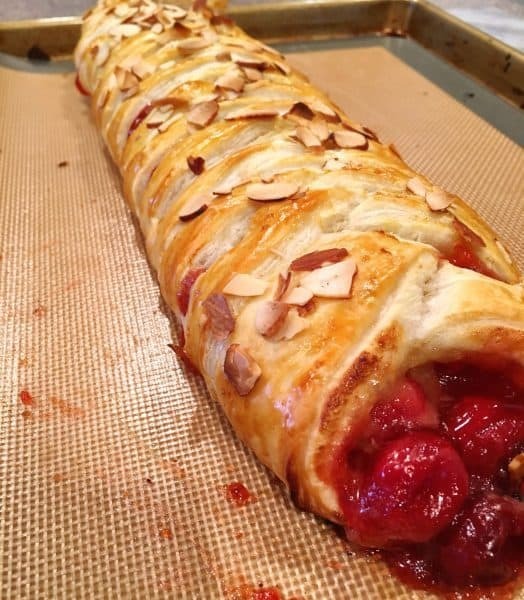 I’ve got all these recipes circling around in my head, but this time I made a big long beautiful Danish braid. I love how this turned out and I love how easy this recipe is. Wasn’t too sure how the cherry lemon combination would turn out? Can I just say…HOLY YUM! Preheat the oven to 350°. Unroll the dough carefully. Leave the dough on the parchment paper. Use a knife, or pizza cutter, make cuts up the two sides of the pastry dough. Each slice should be 3/4 an inch wide and about 2 inches long. Spoon 1 1/2 cups of Cherry Pie filling down the center of the puff pastry. On top of the Cherry Pie Filling spoon 1/2 cup of Lemon Curd. You can use either homemade…you can find the recipe for the Easy Microwave Lemon Curd HERE…or you can use store-bought. They will both work. Starting at one end, fold one piece upward toward the center, diagonally, and do the same on the other side. Continue on up the pastry, folding one over the top of the other diagonally. 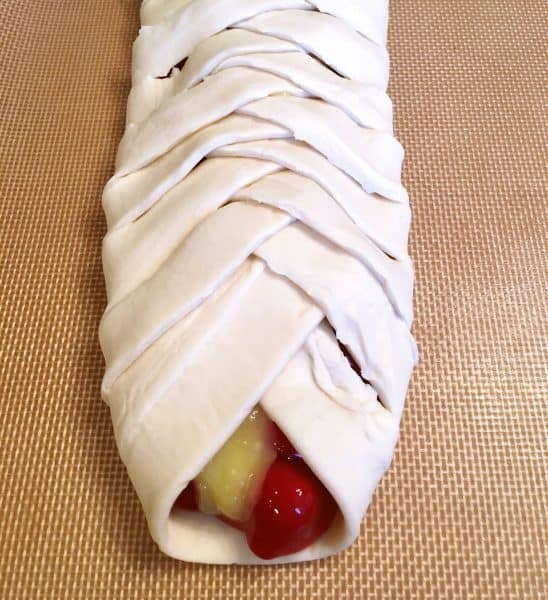 Do this until the filling is covered and the dough looks like a “fish tail” braid. Tip: Don’t worry about being super “neat”, and it’s okay if the filling is peeking out a little. It’s the perfect way to torment your friends and family! Lift the braid off the paper and place it on a silicon lined baking sheet, or a baking sheet lined with fresh parchment paper. Beat one large egg. 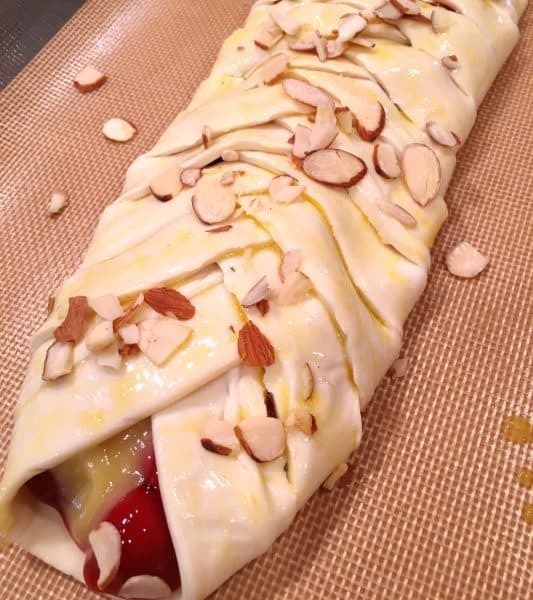 Using a pastry brush, brush the top of the Danish with egg wash. Sprinkle with Sugar and Sliced Almonds. Place in preheated oven and bake for 25-30 minutes or until pastry is puffed and golden brown. There you have it. The perfect weekend Danish! Isn’t that easy peasy? 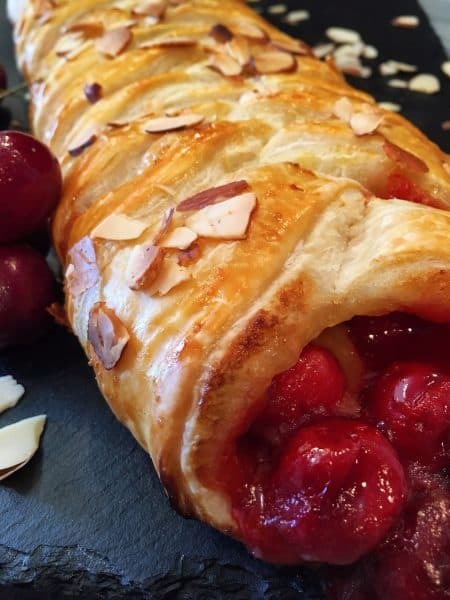 I don’t know about you, but if I can have a flaky cherry lemon filled Danish that will feed the whole family in a matter of minutes…that’s a “Win-Win”! If you make this recipe be sure to comment below and share a photo with me. 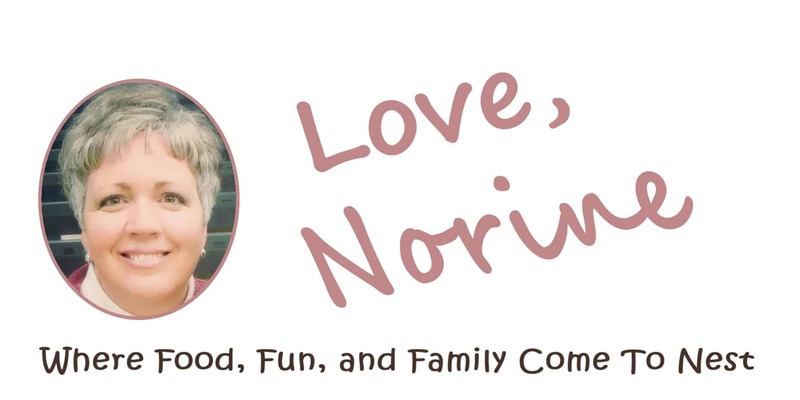 Hashtag me on Instagram at norinesnest. I’m sharing this yummy recipe on Meal Plan Monday. Click HERE to find it and lots of other wonderful meal plan ideas. 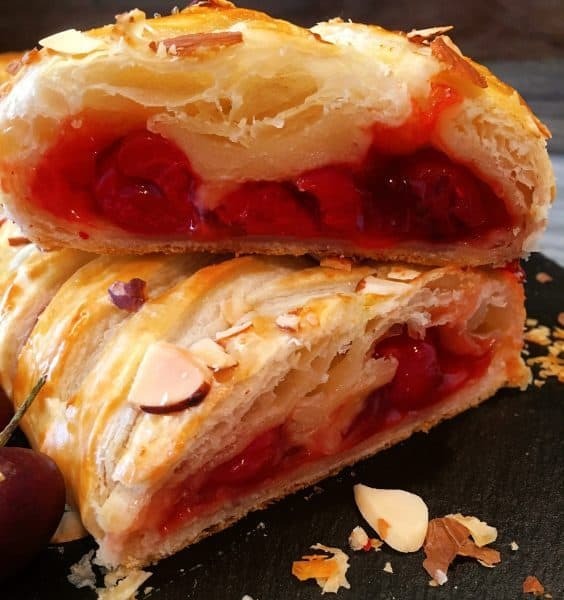 Golden Flaky Puff Pastry is filled with Cherry filling and Lemon Curd and baked to perfection. 1/4 cup of Slivered almonds. 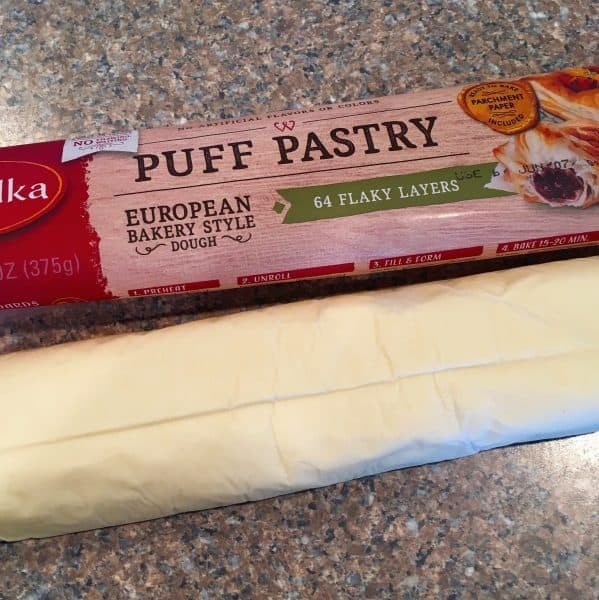 Unroll package of Puff Pastry. Using a knife or pizza cutter, cut 3/4 inch wide slices, 2 inches long, up both sides of the puff pastry. Make sure to leave the center uncut. Spread Cherry Pie filling down the center of the Puff Pastry. Spoon Lemon Curd on top of the Cherry Pie filling. Starting at one end fold one strip of dough up diagonally towards the center. Repeat on the other side. 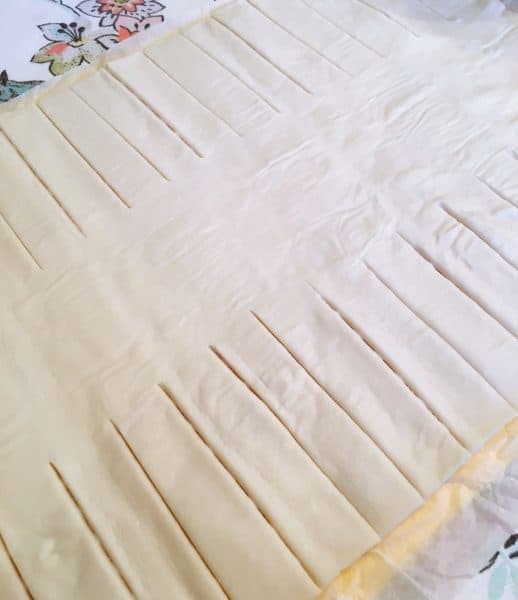 Continue folding strips from one side to the other like a braid. 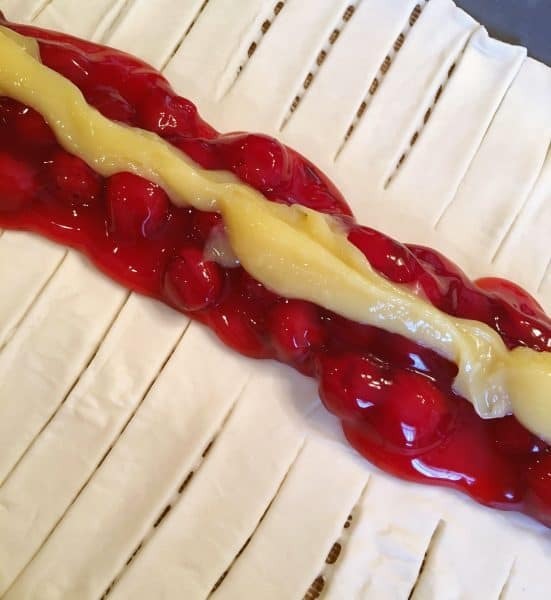 Carefully Remove the paper and place the the danish on a silicone or parchment paper lined baking sheet. Whip egg until light and frothy. Brush on top of the danish with the egg wash.
Sprinkle with sugar and slivered almonds. Place in oven and bake for 20-25 minutes checking frequently. When golden and puffy remove from oven.